63 km. from Nice airport. Leaving from Nice take route RN202 north, go 2 km past St Martin du Var) then turn left onto route RD17 for 30km., then left again onto RD10. 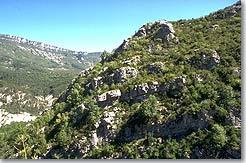 Aiglun is perched on the side of Mount St. Martin, and at the foot of this forested massif runs the river Esteron. From the village there is an impressive view straight down onto the river. Its tall ancient houses are nestled around the town hall and the parish church St. Raphael (18th c.). 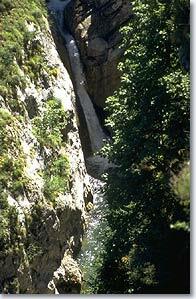 Aiglun is the inspiration site of the Provencal poet Frederic Mistral for his poem entitled "Calendal". 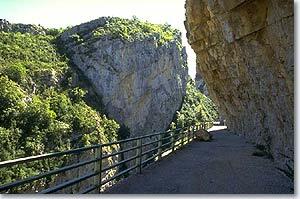 Clue d'Aiglun (2km. long, 200 to 400 m. high). Vegay Watertall. The ancient bridge with its view. St. Martin Grotto. Troglodyte castle. Rural chapels: St, Joseph, St. Raphael.